Noles CRUSH Stanford En Route To OMAHA! 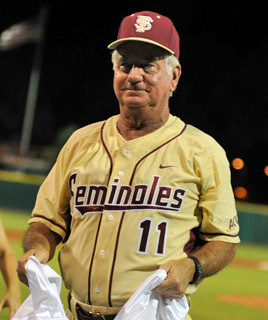 One of the best coaching jobs of #11’s career has his Noles back in Omaha! 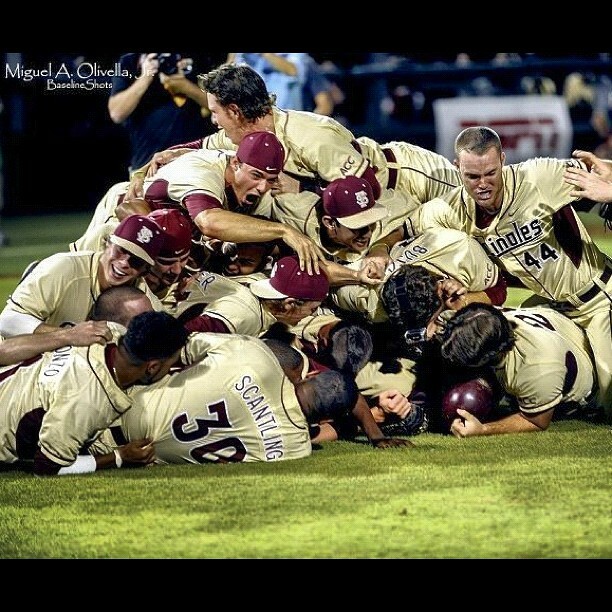 The Florida State Seminoles baseball team is headed back to Omaha, Nebraska and the College World Series for the 21st time and 15th under the tutelage of head coach Mike Martin (better known in Tallahassee simply as #11). After a two game sweep over the Stanford Cardinal where the Noles outscored their central California opponents by a total of 35-8 over the weekend to win the Tallahassee Super Regional the Seminoles are headed back to college baseball’s biggest stage just five wins away from completing their “One Goal” mission for the season. It wasn’t supposed to be this easy. The Stanford Cardinal came to Tallahassee with a 41-17 record and started ace Mark Appel, the #8 overall pick in the 2012 MLB Entry Draft, on Friday night and then third round pick Brett Mooneyham in last night’s game two. Neither starting pitcher looked like a professional prospect during their trip to Tallahassee though. Mark Appel was tagged for a 7 run inning on Friday night where he allowed just 4 hits, and then in last night’s deciding game Mooneyham did not even record an out in the second inning before being pulled for the Stanford closer (yes, in the second inning). FSU’s bats, and the fantastic crowd and the high humidity in Tallahassee were the main reasons for the failures of these Stanford pitchers, but if you were listening to the ESPN broadcast by Nomar Garciaparra and Mike Patrick you would have sworn that it was those pesky final exams that Stanford’s players had to take in their hotel room after the game were the difference (even in a 17-1 ballgame, yikes). This is one of the younger teams that Florida State has ever thrown out on the field, and they have already exceeded the expectations of many fans and followers of college baseball. That’s not to say that senior leadership hasn’t played a role, as third baseman Sherman Johnson had a couple of his best performances of his college career over this past weekend going 5-9 (.555 average) with 6 RBIs including a home run last night. This team also has an amazing leader and an even better person in outfielder James Ramsey, who as I’ve mentioned before was a first round pick of the St. Louis Cardinals this year. For the most part though, freshman have provided the sparks for this team, particularly on the mound. Brandon Leibrandt and Mike Compton pitched brilliantly this weekend as they have the entire postseason, and they are a huge reason why the Noles are headed to the College World Series and playing on through the middle of June. This series win was so great for the Seminoles that even football head coach Jimbo Fisher got in on the action. After being coerced by the Animals of Section B (the rowdy fans that sit in that section behind home plate) Jimbo was aided in performing a N-O-L-E-S chant that made the crowd go crazy and probably confused the Stanford dugout. For his performance, Jimbo Fisher trended worldwide on Twitter for a brief moment, and he also got laughed at by his beautiful wife Candi. The College World Series is a huge event and probably the only thing that can bring people to Omaha, Nebraska in the middle of summer (well except for Triple Crown Sports Omaha NIT Little League tournament conveniently coinciding with the College World Series and jacking hotel room rates through the roof). Eight teams are left competing for a chance at a National Championship and Florida State will play against the Stony Brook Seawolves, Arizona Wildcats, and UCLA Bruins this weekend for a chance to play in a three game winner-take-all series with the winner of the other 4-team bracket (projected to be the hated Florida Gators). For coach Mike Martin this one ranks up their among the top accomplishments, and he knows there is still unfinished business to attend to. But today, let’s celebrate what this team has already done and look forward to the future. See you in Omaha, Noles! This entry was posted in FSU, NCAA and tagged Baseball, College Baseball, College World Series, CWS, Florida State, FSU, Omaha, Sports, Stanford. Bookmark the permalink.